The gastrocnemius muscle is a part of the superficial flexors of the leg and it is one of the largest and the most superficial among muscle among the muscles of the posterior compartment in calves. It emerges from two a lateral and a medial head. It arises from the femur and it crosses the knee joint and the ankle joint. The gastrocnemius muscle has two heads, a medial and a lateral head. The lateral head arises from the lateral surface of the lateral femoral condyle and medial head of the gastrocnemius comes from the posterior surface of the femur above the medial femoral condyle. The medial head is larger and extends lower than the lateral head of the gastrocnemius muscle. The medial head of the gastrocnemius emerges in a triangular area on the popliteal part of the distal epiphysis of the femur. The medial emergence comprises of a flattened, thick, and tough tendon that crosses the medial condyle, along the medial supracondylar ridge and immediately below the insertion of the tendon of the adductor magnus muscle. 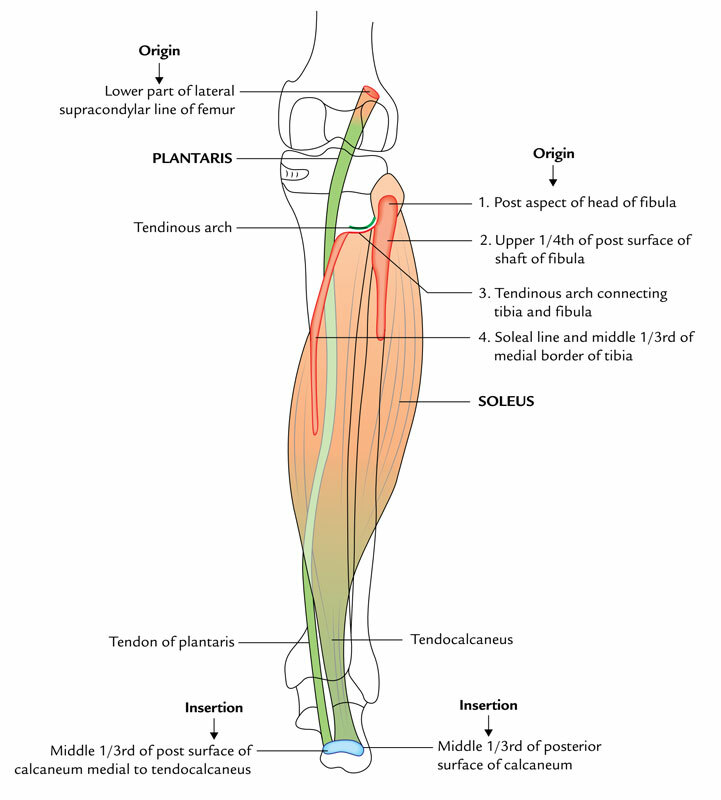 The lateral origin, less important, enters through short tendinous and muscle fibers on the popliteal part of the medial femoral condyle, in a small eminence called the medial supracondyloid tubercle that is also known as the medial supracondylar tubercle and on the capsule of the knee joint. The lateral head of the gastrocnemius muscle originates proximal towards the attachment of the popliteal muscle tendon in the lateral supracondylar ridge and from a tendon in a fossa located posterior to the lateral epicondyle. Where a small bony eminence known as the lateral supracondyloid tubercle a.k.a. the lateral supracondylar tubercle can be observed, small tendinous fibers and muscle fibers located medial to this tendon emerge on the capsule of the knee joint and on the popliteal aspect, albeit less typically than on the medial side. Triceps surae muscle group as a group, these muscles are large and powerful because they propel the body forward off the planted foot at the time of walking and can elevate the body upward onto the toes when standing. Gastrocnemius and plantaris emerge on the distal end of the femur and can also bend the knee. The medial head is attached just behind the adductor tubercle and superior to the articular surface of the medial condyle to an extended roughening on the posterior part of the distal femur. The lateral head emerges where it connects the lateral supracondylar line from a unique facet on the upper lateral surface of the lateral femoral condyle. 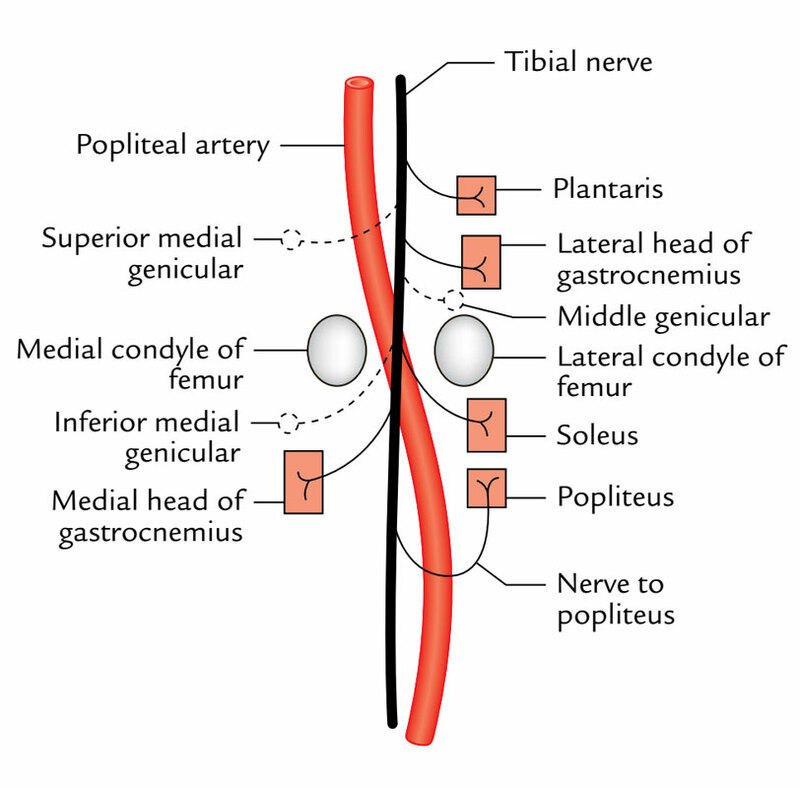 At the knee, medial borders of the lower end of the popliteal fossa and the dealing with margins of the two heads of the gastrocnemius create the lateral margin. 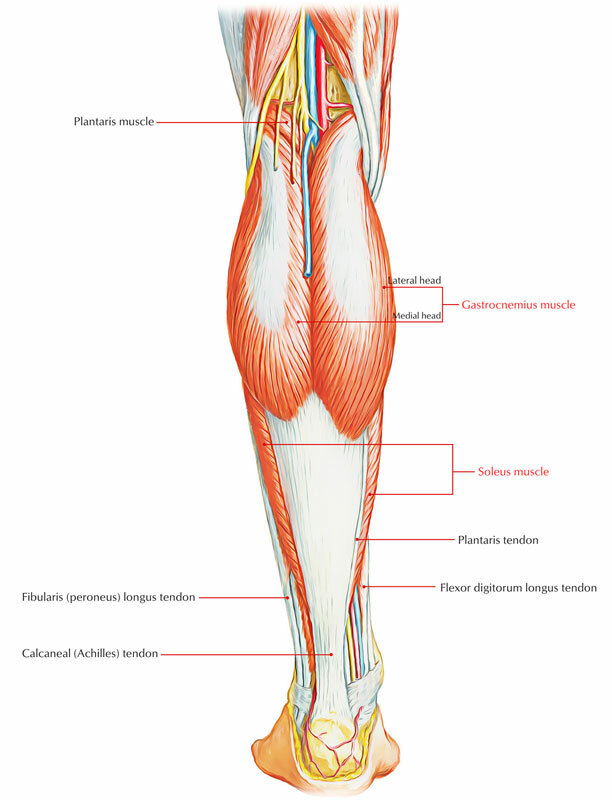 A single elongate muscle belly is created by mix of gastrocnemius, which creates much of the soft tissue bulge recognized as the calf in the upper leg. The calcaneal tendon is created by the muscle fibers of the gastrocnemius gather with those of the much deeper soleus muscle, which connects to the calcaneus of the foot in the lower leg. The fleshy bellies of the two heads go down and combine at the middle of the leg in order to form broad thin aponeurotic tendon. It attaches the tendon of soleus, a short distance underneath the middle of the leg in order to create a long thick tendon known as the tendocalcaneus (tendoachillis). It enters into the middle of the posterior surface of calcaneum. In the popliteal fossa both heads are supplied by the tibial nerve. It is the chief plantar flexor of the foot at the ankle at the extension of knee. It is also a flexor of the knee. During running and leaping it provides quick movements of the foot.